In Victorian style marmalade, whole oranges are boiled in water for several hours. Due to my cribbed notes I was unsure as to what the goal of this step was. Since then I have read that the oranges should be easily pierced with a skewer and express a type of 'deflation' and that the peels should be thoroughly cooked. The next step is to cut the peel into pieces according to personal preference (I lazily cut my peels into huge pieces). The peel is then boiled with sugar, water, and a jelly bag filled with the pith, seeds, and membranes of the orange) until it passes the standard jell test. To acheive a nice suspension of the peels, the mixture is allowed to stand for 15 minutes and then processed - my peels were too thick to suspend! Cover oranges with water and boil for two hours or until 'deflated'. Discard water and cool oranges. Cut oranges in half. Strain pulp and reserve liquid. Combine reserved liquid with sugar and water. Add jelly bag filled with pith, pulp and membranes of oranges. Boil until mixture passes jell test. To achieve suspension, let mixture cool for 5-15 minutes. Then process in water bath for 15-20 minutes. Makes 6 500 mL jars. Tasting Notes: I actually enjoy the largeness of the pieces of peel, however several jars did not have enough 'jell' around the peel. So next year I will increase the amount of water and sugar by one cup each. This project was inspired by my 2013 Culinary Goals. 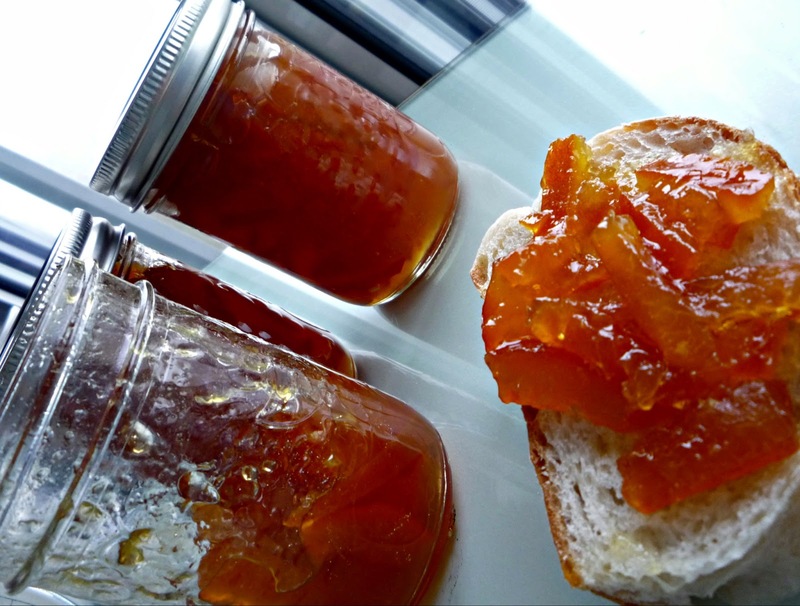 this post on Spicy Seville marmalade will keep you inspired while this article on the history of marmalade will give you something to read while you wait until next year.